… ständig trieft einem die Nase von der Kälte, aber wir wollten ja den Norden mit den Mopeds bereisen… dem Abenteuer wegen…wir haben das Abenteuer und sagen uns so manches Mal, ach hätten wir doch…aber egal, jetzt müssen wir durch.. nur haben wir doch mal wieder unseren Plan geändert und sind die letzten Tage viele viele Kilometer am Stück gefahren. From Harstad, a little north of Narvik, we drove to the Lofoten Islands until the southern point to Moskenes. The Lofotes is an archipelago, which is about 100 to 300 km north of the Arctic Circle in the Atlantic Ocean and is separated from the mainland by the Vestfjord. The weather forecast had announced four days of sunshine with a few clouds for the Lofotes, but we had one day with little drizzle and could see now and then a few rays of sunshine between the gray sky…but the landscape of the Lofotes still could convince us, a change of rock and moss-covered fields on one side and typical coastal scenery on the other side, whereas the snow-white sandy beaches now and then are surprising, and thus the water gleamed turquoise blue when the sun did shine once or twice … beautiful views which invites you to linger…. Mit der Fähre von Moskenes nach Bodø ging es wieder aufs Festland und dann südlich auf der RV17… eine tolle kurvenreiche Küstenstrasse, die teilweise mit Fähren unterbrochen ist… man findet hier sehr leicht schöne Plätze zum wild campen, da die Bevölkerung auch nicht so dicht besiedelt ist, wie in Südnorwegen.. da es jedoch auch hier kalt und nass war, hiess das für uns entscheiden, weiter auf der schönen Strasse im Regen fahren oder ab ins Inland und dort nach Süden, wo es zum einen weniger Regen und zum anderen angenehmere Temperaturen zum Moped fahren hat. 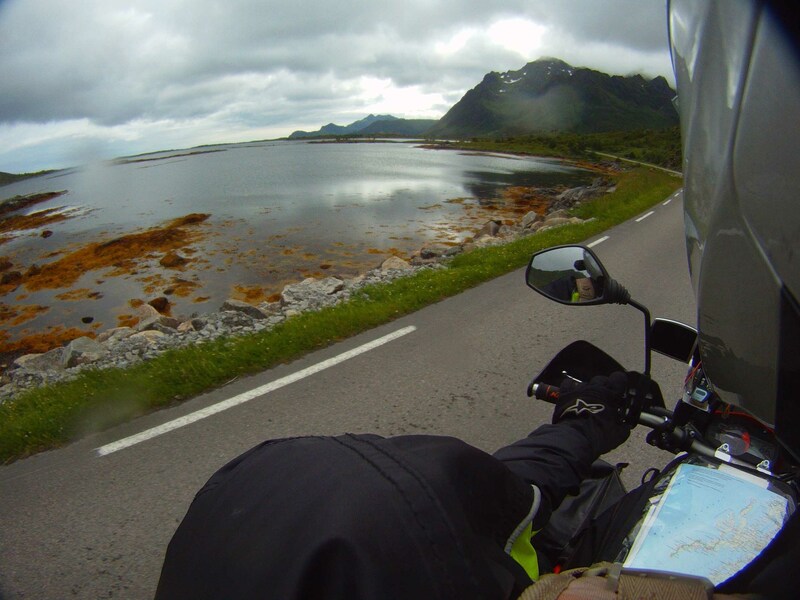 We took the ferry from Moskenes to Bodø to the mainland and then south on the RV 17 .. a nice curvy coastal road which could partially driven only by smaler ferries…. you will find easily nice places for bushcamping, because it is not as densely populated as in the southern part of Norway… but it has been cold and wet there too that is we had to decide whether to ride nice roads in bad conditions and rain or go inland and further south where it is raining less and there are most pleasant temperatures to ride a motorcycle. We drove around 300 and 400km per day towards the south and are now west of Oslo in Hokksund.. tomorrow we will go to Kristiansand where we will take the ferry to Hirtshals in Denmark within the next couple of days…..
Schweden war schnell durchfahren, nachdem wir den ganzen Tag im Regen gefahren sind, unsere erste Hütte mieten mussten, weil das Aufstellen eines Zeltes im Sumpf keinen Sinn mehr gemacht hätte…den Moskitos konnten wir ein wenig mit dem Aufstellen von Antimoskitospiralen entgegen wirken, doch als wir eine Campingkarte für € 18 kaufen sollten, damit wir dann noch mal € 20 fürs Campen bezahlen dürfen, war uns das zuviel und weiter ging es nach Norwegen, wo man jederzeit Wildcampen kann. Sweden – we crossed very quickly as we drove the first day in total rain and had to take our first cabin because putting up the tent in a swamp just did not make any sense….We could work against those mosquitos while putting up some mosquito coils, but as we were asked to buy a camping card for € 18 just to pay another € 20 for putting up the tent, we decided that was enough for Sweden and we went further to Norway where you can bush camp everywhere you like and find a public spot. Das Wichtigste jedoch war, dass wir den Polarkreis überschritten hatten, d.h. es wird erst sehr sehr spät – wenn überhaupt – dunkel. Am Polarkreis geht die Sonne am Tag der Sommersonnenwende nicht unter. Diese Erscheinung, die Mitternachtssonne genannt wird, fällt auf der Nordhalbkugel meist auf den 21. Juni – wir haben sie leider verpasst dieses Jahr, aber vielleicht schaffen wir es ja auf der Südhalbkugel, wo sie auf den 21. oder 22. Dezember fällt. The most important thing to mention is that we crossed the artic circle which means that it will get dark very very late if actually the sun will go down. In or around the artic circle the sun does not set on the summer soltice. This phenomenon is called the midnight sun and falls mostly on the 21th June in the northern hemisphere – unfortunately, we missed it this year but maybe we will make it at the southern hemisphere where the summer soltice is supposed to be on the 21th or 22nd December. Kaum waren wir in Lappland, liefen uns auch schon die Renntiere auf der Strasse entgegen…da fragt man sich wirklich, ob es da schon bald weihnachtet…genügend Kiefernwälder für die entsprechenden Tannenbäume gibt es jedenfalls. Es war gerade noch Zeit zur Fähre nach Helsinki und als hätten wir an dem vorigen Tag nicht genug erlebt, ging zu guter Letzt Thomas`KTM im Hafenareal vor der Fähre aus und sprang nicht wieder an… d.h. für Thomas hiess das erneut sein Moped auf eine Fähre schieben. It was just the right time to get to the ferry to Helsinki and as if we did not have enough adventure the last day – did Thomas`KTM again make trouble just right infront of the ferry and didn´t start again … which meant for him – pushing the bike on the ferry again. Helsinki awaited us with sunshine – a good sign. After Thomas pushed his bike from the ferry, we gave it a starter help with my KTM and as if nothing was wrong did she start again…now it seems to us that she just does not like any ferries at all… we will try to avoid them for the future . Der Typ, der von uns € 12 fürs campen wollte, hat sich mit € 10 begnügt und die restlichen € 2 können wir fürs saunieren benutzen …. Da es nun doch zu regnen angefangen hatte, dürfen wir für die € 10 im „Strandhaus“ übernachten und können das Zelt trocknen lassen. Die finnische Gastfreundlichkeit zeigte .er und gleich, als er mit extra Holz sowie frischen Gurken und Tomaten aus seinem Garten ankam… unglaublich….morgen schauen wir wie es weitergeht…. The guy who wanted € 12 for the camping did take only € 10 and the rest we could use for a great Sauna… As it started to rain in the afternoon, we were also allowed to sleep in the „beachhouse“ fort hese €10 and could let the tent dry. We also found the first finnish hospitality as while this guy came back to bring us more firewood, fresh cuecumber and tomatoes from his garden… amazing…tomorrow we will see how it goes on…. Am nächsten Tag erwachten wir mit Sonnenschein und weiter ging es nach Norden… wo wir jetzt etwas südlich von Kemi sind und uns entschlossen haben, das regnerische Wetter einen oder zwei Tage auszusitzen, um dann mit Sonnenschein in Richtung Schweden, Norwegen zu fahren. 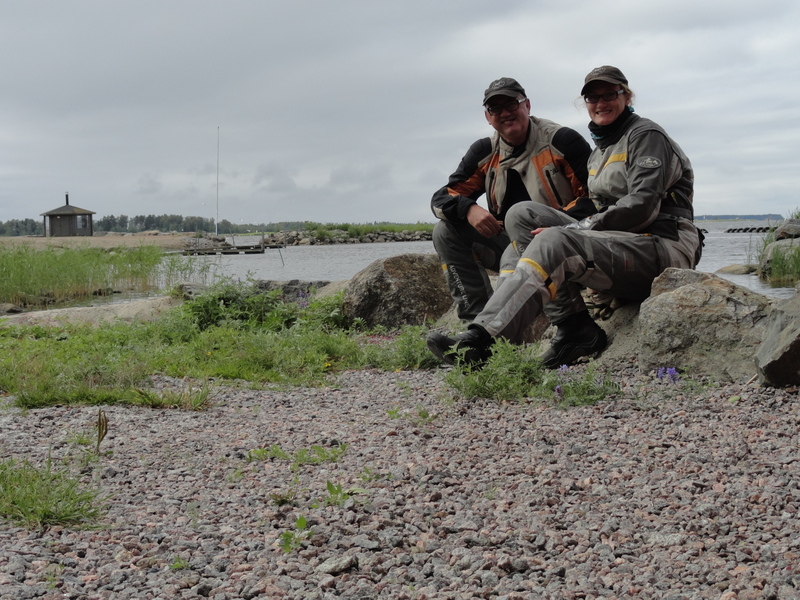 On the next day we woke to sunshine and drove on towards the north…where we are now a little south of Kemi and have decided to stay and “sit out” the bad rainy weather one day or two to carry on towards Sweden and Norway in sunshine. In Lettland fuhren wir unsere erste Wellblechpiste für dieses Jahr und wurden beim Campen von den vielen Moskitos fast aufgegessen….unglaublich wie die Thomas lieben, ich hab da ja immer etwas mehr Glück! We drove our first gravel road of this year.. and have been eaten by a lot of mosquitos while camping… incredible how they love Thomas – I have always a bit more luck with them! Wir sind an der Küste über das Kapp von Lettland in Richtung Riga unterwegs und können vom Wasser gar nichts sehen, da die gesamte Strecke links und rechts mit dichtem Nadelwald bedeckt ist. Keine schöne Küstenstrasse wie man denken würde, wenn man sich die Karte und Route in Lettland mal anschaut. We drove along the coast to the north of Latvija – direction of Riga and couldn´t see anything of the water because the entire route is on the left and right covered with dense coniferous forest. No nice coastal route how you would guess from looking on the map and the route in Latvija. Anyway, we have camped in Jurmala near Riga and bought two days later a spare gas filter for the KTM because we have had to clean the filter of Thomas`KTM already that we thought – ok – we will buy a new one just in case my KTM will make trouble too…that made us prepared or at least we thought – typical german…. I am curious if we will get rid of this attitude soon and can enjoy the present… but as if we had known it, nearly 50 km north of Riga we had the next breakdown. Weiter ging es nach Nöo in Margus´ Mom`s Haus und dort verbrachten wir dann ein tolles verlängertes Wochenende mit Margus und Kariina. Wir konnten Tartu ein bisl kennengelernen, wo beide nach ihrer Weltumrundung jetzt Arbeit gefunden haben, wurden lecker bekocht und natürlich konnten wir – für jeden Traveller wichtig – die Wäsche waschen. Danke noch mal an die beiden und Margus`Mom für ihre tolle Gastfreundschaft und Unterstützung. Nach 4 Tagen und um einige Tipps und sicherlich auch Kilos (wir haben so jedes Bier, was man in Estland kaufen kann, gekostet und lecker Fleisch- und Fischbarbecue gegessen) hiess es dann am Montag wieder auf die Mopeds… es ging zum Peipsi See, der genau an Russland grenzt (für Thomas auch der Pepsi-Lake). We drove all the way to Nöo where we stayed at Margus`mom´s place and had a great long weekend with Margus and Kariina. We have seen a little bit of Tartu where both are now living and working after there round the world trip, we have been invited to great food and – very important for all travelers – we could wash our clothes. Thanks again to both of them and Margus`Mom for their great hospitality and help. After 4 days and packed with a more advice to travel on and probably some more kilos of weight ( we have tested almost all beer which you can buy in Estonia, and ate great meat and fish from the barbecue) we said Goodbye on Monday to leave for the Peipsi Lake which boarders to Russia (Thomas named the lake – the Pepsi Lake). Dort wollten wir eigentlich übernachten, aber da es zu viele Moskitos gab und fuhren wir deshalb nach Norden zur Küste, wo wir ebenfalls einen Tipp erhalten hatten. Wer konnte denn ahnen, dass der Montag noch so einige Überraschungen für uns bereithielt. Ich genoss gerade die gelben Rapsfelder und den Duft von frischem Raps in der Luft, schwelgte noch im Erdbeerland, nachdem wir an mehreren Erdbeerfeldern vorbeigefahren sind, als Thomas plötzlich vor mir eine Vollbremsung hinlegt und da schwante mir schon Schlimmes…für alle diejenigen, die unsere erste Reise ein wenig verfolgt hatten – ja er ist schon wieder von einem Tier gestochen wurden… diesmal eine Wespe – voll in die Backe. Actually, we wanted to stay there but it had too many mosquitos and we drove on to the north to get to the coast where we also had some advice from Margus. Who could have forseen that the Monday would have more surprises for us… I enjoyed riding and smelling the yellow canola field, indulged by the smell of the fresh strawberries – the fields we had passed before… as Thomas made a emergency break just infront of me and bad memories dawned on me… for all of those who have followed our first travel … yes he got stung by a insect again… this time a wasp – fully into the cheek! After I inject the medicine which I really injected Thomas in his leg and not me in my thomb and two hours break we were on the road again…. to the next campground as although we had this great advice I didn´t want to takethe chance that some late effects would show and we would be somewhere in the middle of nowhere. We found a really nice campground near Vösu for € 10 and while Thomas was recovering I went into town to organize a new autoinjection from the pharmacy… but nope – we are are in Europe not in Southamerica – without a prescription no medicine – that meant I had to go to see the doctor who was working late especially for me and I could get hold of a prescription for Thomas. The next day we drove to the pharmacy in Tallin which was supposed to have the Epipen but no – not in Estonia …the first one did not have it anymore ..we went in town to another one which had the medicine we needed. Now we are again prepared for the next bee or wasp stungs…..
… we have uploaded via Flickr our first pictures of our trip …. Die Überfahrt auf der Fähre verlief ruhig und in sehr netter Gesellschaft – wir haben Claudia und Bernd aus Hannover kennengelernt und alle vier sofort super verstanden… und das littauische Bier (Alus) auf der Fähre auch gleich getestet…Kaum waren wir in Klaipeda angekommen, fuhr ich los, um eine Unterkunft sowie Transportmöglichkeit für Thomas´KTM zu besorgen…ich war etwas besorgt, dass ich das alleine machen sollte, da ich doch bisher noch nicht wirklich nach GPS, sondern immer nur Thomas hinterhergefahren bin… und dann noch in Littauen in einer relativ grossen Stadt – zumindest sah Klaipeda von der Fähre aus ziemlich gross aus… meine Russischkenntnisse, die mir vielleicht ein bisl helfen könnten, waren sehr sehr eingerostet… ich war dementsprechend ganz schön aufgeregt, als ich von der Fähr fuhr und Thomas sein Moped wieder von der Fähre runter schob. Ich liess ihn alleine im Hafen stehen und machte mich auf dem Weg. Zunächst zum Hostel, das mir nicht gerade vertrauenserweckend aussah und dann quer durch die Stadt zur Touristeninfo. I left Thomas alone and could organize a van with the help of the tourist information and only had to find the way back to the port which was several kilometers away… it was not that easy as I didn´t know how to use the GPS. Reminder for the next time:before starting a trip, find out how the GPS is working and not only trust the man J after almost two hours I was back in the hostel where we put the bike on a trailer and brought it to the campground. Dort trafen wir wieder auf Claudia und Bernd und wurden gleich zum Abendessen eingeladen… was für ein Willkommen in Littauen… nach leckeren Spagetti mit frischer Pilzsauce und zwei Flaschen Rotwein fanden wir am Strand dann auch ein Lokal, wo die Männer das Deutschland Halbfinale Fussballspiel anschauen konnten, während wir Frauen uns mit einem Strandspaziergang bei Sonnenuntergang vergnügten. Nach vielen Geschichten und Lachen konnten wir trotz der Probleme mit dem Motorrad gut schlafen und am nächsten Morgen machte sich Thomas daran, die KTM auseinander zubauen, um den Fehler zu finden…. Auf diese Freude hin, entschlossen wir uns mit Claudia und Bernd das Touristenprogramm – die kurische Nehrung –mit Bus und Fähre in Angriff zu nehmen und verbrachten gemeinsam einen tollen Tag auf der Nehrung mit Dünenwanderung und noch mehr Geschichten…. Happy as we were, we decided to do the vacation tour – the curonian spit – with Claudia and Bernd by bus and ferry. We spent a great day together while walking on drifting sand dunes and even more stories…Am nächsten Tag ging es dann weiter – die KTM sprang ohne Probleme an – nach Norden, wo wir nun irgendwo in Lettland an der Ostsee unser Camp aufgeschlagen haben…. The next day – the KTM started without any problem – we started towards the north where we are now somewhere on the coast of the east sea in Latvija … the next days we will keep riding north along the coast to Riga and then further to Estonia where we will meet up with Margus and Karina who we know from Southamerica since 2008 and who visited us last autumn in Switzerland. We are looking forward to learn more about Estonia and get to know all the secret places…. Eine ruhige Nacht auf der Kaunas liegt hinter uns, der Fähre zwischen Sassnitz auf der Insel Rügen und Klaipeda in Littauen, unser nächstes Ziel. Eigentlich wollten wir schön gemütlich die Küstenstrasse nach Norden fahren, dort einen schönen kleinen Campingplatz suchen, um uns wieder an das Zelten und Bepacken der Mopeds und ein neues Land mit fremder Sprache und Kultur zu gewöhnen. Aber es kommt wieder einmal anders als wir dachten…. After riding through the black forest on Tuesday evening to catch the car train from Lörrach without any trouble and the getting on the train wasn´t any problem at all, even our cuchet on the train was great, we had not yet realized that we are on the road again,traveling … it seems more that we are on our usual vacation trip like the last years…. that is probably also because of us returning in two month to the black forest to repack the bikes and get us and the bikes ready for Africa…. nearly 24 hours later we were on east sea on a ferry which we would probably would not have reached without any help…. Als wir morgens um kurz nach neun Uhr pünktlich in Hamburg mit dem Zug angekommen sind, fuhren wir die Autobahn bis Rostock, von wo wir dann die Landstrasse Richtung Stralsund nahmen. Wir hatten noch ein wenig Zeit bis zur Fähre und wollten noch ein wenig auf der östlichen Insel die kleinen Städtle erkunden, als Thomas´KTM plötzlich spuckte und dann mitten auf der Abbiegung ausging… schieben war wieder einmal angesagt… Glück im Unglück oder wie man so schön sagt, hatten wir dann wie schon so viele Male vorher, wenn etwas an den alten Motorrädern kaputtging. Ein kleiner Transporter der Firma, wo wir gelandet waren, ich erinnere mich nicht mehr an den Namen der Ortschaft, brachte die kaputte KTM und Thomas zum Fährhafen. We have reached Hamburg by train on time at nine o´clock in the morning and rode on the Autobahn to Rostock where we took the small route towards Stralsund. We still had some time to get to the ferry and wanted to ride a little around the island, nearby the small little villages and the coastline.. but then Thomas KTM started to stop running and just stopped on a cross section… we had to push the bike once again…. but we had luck again as some times before when the other bikes didn´t run anymore… we could take a small van from the company nearby (I don´t remember the name of the company anymore) and they took Thomas´bike to the ferry. Wir konnten als erste Aufladen oder besser gesagt, Thomas konnte als erster sein Moped ins Schiff schieben. Ja schieben, weil sie nun gar nicht mehr anlief. Wir werden versuchen, sie in Klaipeda irgendwie zu reparieren bzw. erst einmal herauszufinden, wo der Fehler liegt und hoffen, dass dies keine kostspielige Reparatur mit sich bringt. We were allowed first on the ferry as Thomas had to push the bike on it… yep he had to push the bike because it now even didn´t start anymore.. we will try to fix the bike somewho or if we can´t fix it by ourselves we have to find someone in Klaipeda and find the fault and hope it won´t cost too much.